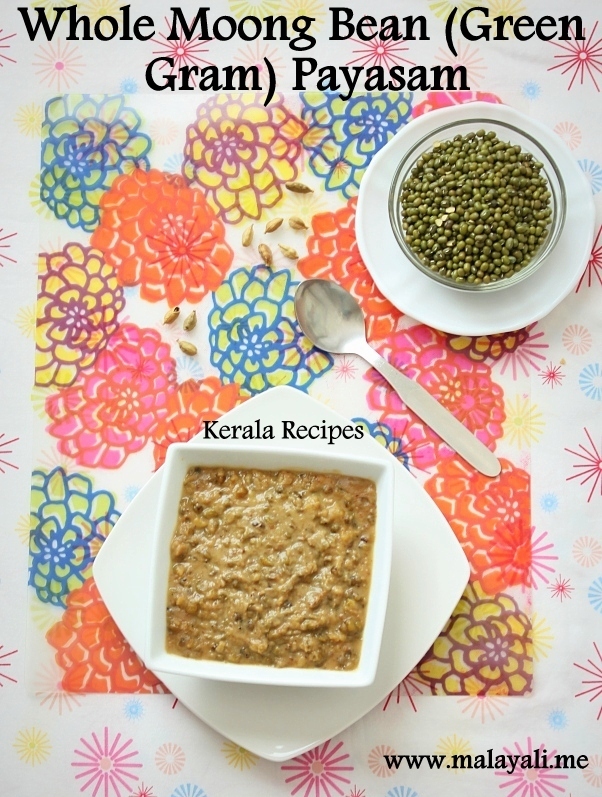 Now that Onam is around the corner, I am here with the recipe for Cherupayaru Payasam. This is a sweet dessert made with Moong/Mung Beans or Green Gram (Cherupayaru). This is a very rich and creamy dessert. A little will go a long way to satisfy your sweet cravings. Though I have made Pradhaman with Cherupayaru Parippu (Moong Dal), this was the first time I tried a Payasam with Whole Mung Beans. When I spoke to an aunt, she told me that Cherupayaru Payasam used to be prepared for Onam at their place by her mother and grandmother. Traditionally, Cherupayaru Payasam is made in Coconut Milk and the moong beans are fried before it is cooked. It is slow-cooked and requires lot of time and effort. 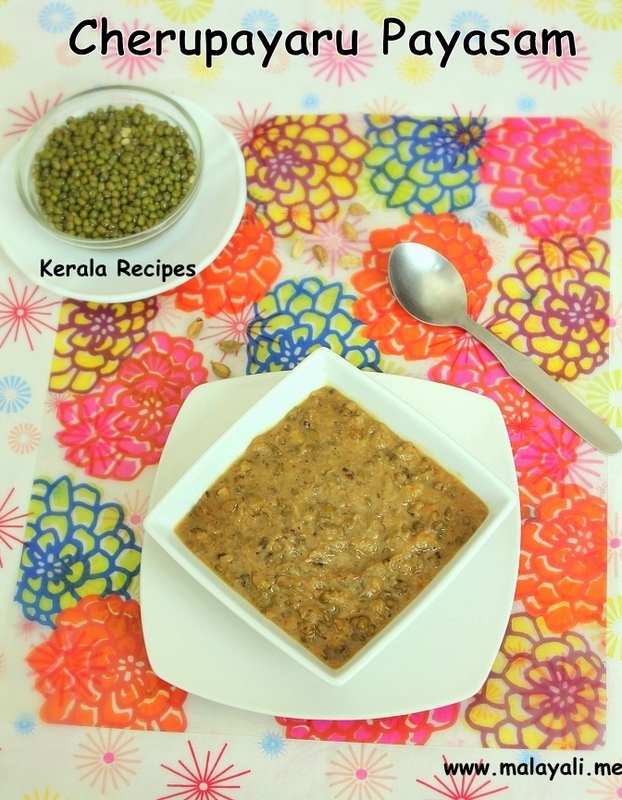 This recipe is a quicker version of making Cherupayaru Payasam. I didn’t fry the beans before pressure cooking, also used both Coconut Milk and Condensed Milk for extra creaminess. As you get ready for Onam this year, try making this wonderful payasam and I am sure you will like it. The only problem is that you won’t be able to resist yourself until you empty the bowl. Wash the mung beans thoroughly. Pressure cook it with 2 cups of water for 3 whistles on medium-high heat. Meanwhile, boil the jaggery in 1 cup of water so that it melts completely. This will take around 10 minutes. Filter to catch any residue and keep the jaggery syrup aside. Once the pressure has subsided, open the pan and check if there is water at the bottom. If so, heat the beans for a few more minutes until the water has evaporated completely. The beans should be well-cooked but shouldn’t become a paste. Heat a wide pan and transfer the cooked cherupayaru to the pan and gently pour in the jaggery syrup. Add a pinch of salt and 1.5 tsp powdered cardamom. Let the mixture cook on medium-low heat for around 5 minutes. Keep on stirring the mixture as it thickens. Now pour in the thin coconut milk and allow everything to come to a slow boil, stirring frequently so that it doesn’t stick to the pan. Add 1 tsp of ghee to the payasam. Simmer the payasam for five-seven minutes. Reduce heat and add 1/4 cup of condensed milk. Mix well and remove from heat after a minute or two. Alternatively, you can add 1/2 cup of thick Coconut Milk. Heat 1 tsp ghee in another pan and roast the grated coconut on medium heat until it becomes a deep brown color. Add the roasted coconut to the payasam for added taste. You may need to adjust the amount of jaggery used depending on the sweetness. I used around 300 grams and it was sweet enough for us. Fresh Coconut Milk is recommended but you can also get away with Canned Coconut Milk or Coconut Milk Powder. If using the Powder, make sure that you dissolve it completely in water before adding it to the Payasam. You don’t want to see the undissolved powder floating around in the payasam.